Charts don’t just go on dashboards, they can go on the forms too. 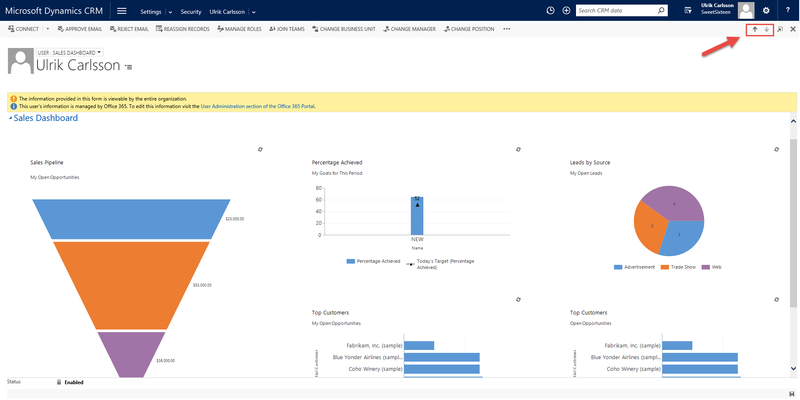 It’s really just a sub-grid that displays a chart instead, but as this seems to be a heavily underutilized feature in MS Dynamics CRM, maybe I can bring some more focus on it with this post. The primary example where form charts can come in handy is for the “Sales Activity Dashboard” that each sales person can look at and see their current statistics, opportunities, tasks etc. A common question from a sales manager is “That’s great, but I want to see all that same data, but be able to flip through the members of my sales team and see the data that they see”. Simple enough as all the views can be filtered to a named user rather than “Equals Current User” which is used throughout the example above. Obviously very cumbersome since you would need a saved view for each sales person and you would have to change the views on each chart individually, or create a dashboard for each person on your sales team, etc. 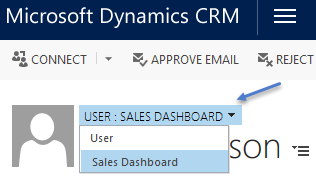 MS Dynamics CRM dashboards do not have good ways of filtering an entire dashboard to a specific user. 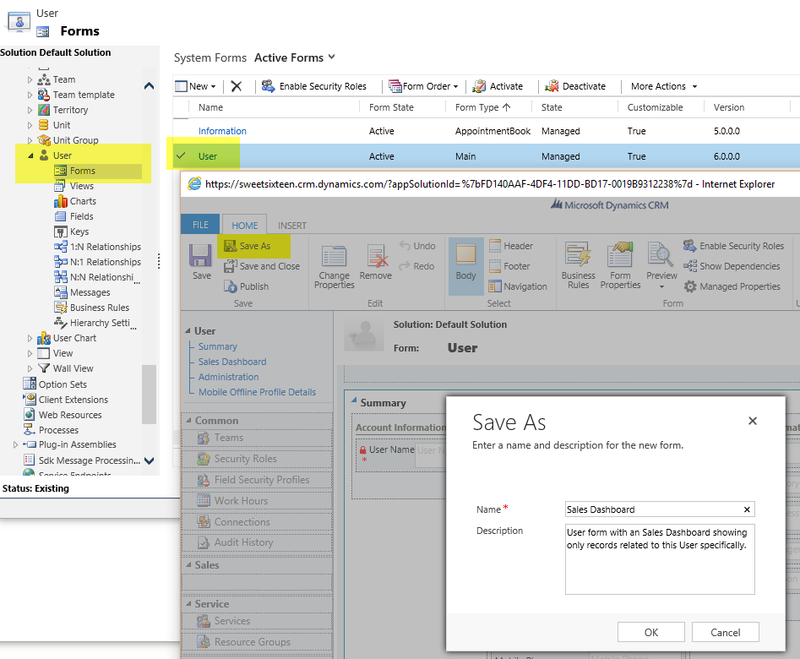 CRM2016 is getting a little closer, but the filter can only be applied to option sets and only in the new engagement hub. However, the combination of charts you are looking at does not necessarily need to be on a dashboard. Same charts as the dashboard, but all user specific and you can circle through the list of users with the arrows in the upper right hand corner. These record specific charts are a very powerful way of bringing insights onto a specific record. In this example it is a sales person, but we could also be looking at service and case KPIs for a service user. From an account record you can add charts with sales statistics, activity statistics, case and service KPIs, all specific to the account. It would give the account manager a very clear view on the current state of the account. Open it and insert a new three-column tab. Now it is time to insert some charts. 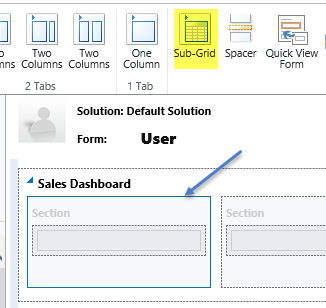 Select the first section in the new tab and insert a Sub-Grid. 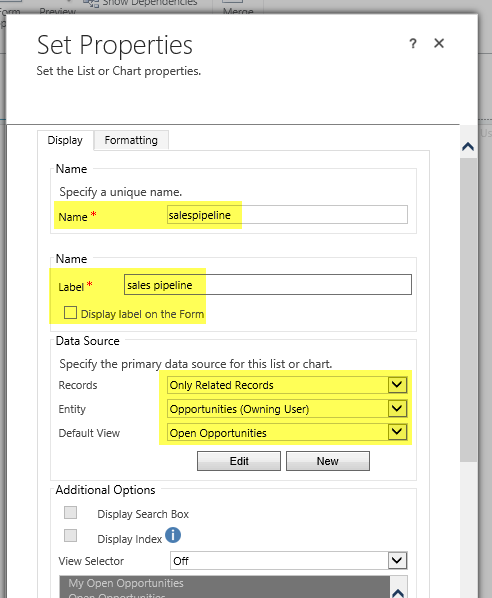 In the Name and Label fields, just write the name of the chart. Make sure the Display Label on the Form box is unchecked. Neither of these values will be shown on the form, or need to be as they are already included in the chart. This is what pulls the right opportunities to build the chart on. In the entity setting, make sure you select the right relationship to the opportunity, which is the owning user in this case. For default view, use a similar, but not the same view as the dashboard. In this case, the dashboard uses the view “My Open Opportunities”. To get the expected result on the user form, use the view “Open Opportunities”. The “Only Related Records” is already filtering to only include opportunities for this specific user. Scroll down and find the chart settings. Leave the view selector off. Note: You can choose to include the view selector and check the “Display Chart Selection”. This will enable you to switch views and chart in the same section on the dashboard. This can be very powerful as well, but in this case I am trying to replicate the standard dashboard as much as possible, and those features were not enabled there. I would highly recommend playing with those features as they can significantly improve your charts and dashboards. Scroll back up on the properties and click the “Formatting” tab. 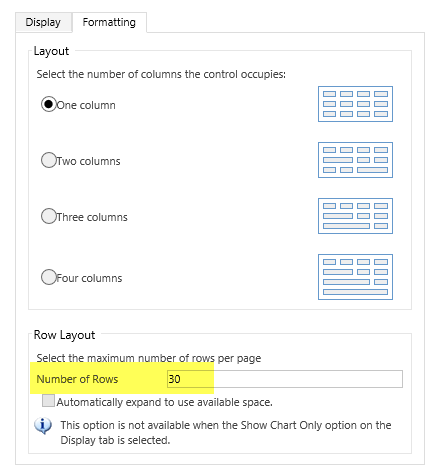 In the row layout, add the number of rows you want the chart to take up. This is a place where you need to be generous. 30 rows for the funnel chart will make it about the same size as the funnel chart on the main sales dashboard which we are replicating. Repeat these steps for the other four charts that are on the sales dashboard. Save the form and publish it. Enjoy the same sales dashboard, but specific to the user you are looking at. Wow, a post with no XML editing!!! Good post Ulrik, it’s nice to be able to improve the look of a rather plain CRM form. Thanks Mark, I appreciate it. Great post! 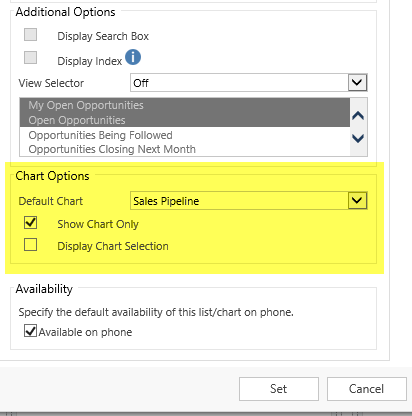 I’m trying to use the Opportunity Product entity instead of Opportunities, and I can set it to show the products that were created by the user, but I’m not able to choose my custom charts that I have on the dashboard. I only have one chart option for some reason. Any ideas? Hi Tim. Thanks for reading. Yes, unfortunately you can only switch to other System Charts on the form. You will have to either upgrade your custom charts to system charts, or have the user open the same records in the associated records view and pop out the chart view there. One thing I’ve noticed is that you can’t seem to drill down on the bars in these User dashboards….do you know how to get around this so it allows you to drill down like the regular dashboard would? I added additional subgrids under the charts and added lists of activities, opportunities. You are able to add several dropdown views to each list grid, in my case, I used different time frames like “Last week, this week, next week, etc.” Hope that helps. Ulrik might have better ideas though. A little late to the party, but got a question i hope someone might have a solution to. I have used this little trick for some time now and my users love it, with the exception of that stupid yellow bar in the top: The one that says information will be visible to the entire organization etc. Know I’m a little lKate ti the party but I have a question I hope someone can help me with. Extremely helpful. However, we implemented Team ownership (as opposed to individual ownership.) I will experiment, but do you know if the filtering recognizes when the user is a member of a team that owns the record? Thanks. If the View you use is filtered based on Team membership, then that will apply to the charts as well. First off, awesome blog on CRM Charts! Truly a wealth of information! Question: is there any way to get hierarchical data shown in charts. E.g. The Associated Opportunities view gives you the option to show opportunities related to this record only or all related regarding records. This would give me all opportunities for the complete account hierarchy. However, when you choose this option, the related charts don’t work anymore. The documentation states that charts on show for views that use FetchXml and not for the QueryAPI. I guess that’s the reason. However, with CRM 2016 you can now query hierarchical data with FetchXml (https://msdn.microsoft.com/en-us/library/dn817893.aspx). With this, do you think we could get charts working with hierarchical data? Great, thanks for all great input. Works like a charm. Except for in the Mobile App on an iPad. (the new app.) The section (tab) on the account form where the charts where included just does not show on the iPad. Tried to troubleshoot, but have not found anything in terms of problems or limitations, although I don’t rule that out. Anyone with any experience in this? Great post! How do I get the number of the week in the current month? Example: Week 1 February, Week 2 February … Thank you! We use this approach to display a Sales Trend chart on the Account form. This chart is build upon the sales information we have of the account (seperate entity). And possible because of Records = Only Related Records. Today I received the request to include this same chart on another entity ‘Account plan’. Account plan information is not stored on Account because each year a new plan is created. There is a direct link between Account plan towards Account, but not between Account Plan and the sales information. I don’t find how to display the chart on the Account plan form. Is this possible? Nevermind – Found the solution myself: by using a Quick View Form on the Account and including the chart in that view. Inserting the quick view on the Account plan form ensurse the display of the chart. Hi GM, glad you found the solution. I was gonna suggest giving the Quick View forms a try too. Great post. I’m trying to combine what I’ve learned from several of your posts. I have 3 child entities that I am trying to combine in one chart on the form of the parent. To do this, I’ve made the option set I am trying to aggregate into a lookup with a N:N relationship to the parent entity. So the three children records are now children to both the original parent and now this new lookup. I can successfully display all three children as the series, and I can display the lookup options as the categories. But the numbers are off depending on which way I add the link-entities. I either get 1 value in each category, all numbers totaled in each category, or it displays all numbers without regard to the parent entity. Is there a way to filter the related entities by the parent entity in the XML? I can’t filter them from the form because the lookup is between the parent entity and the children. I don’t know if that all makes sense. Hi Joseph. First I’d try out the distinct settings to make sure you are only seeing each record once. For this kind of troubleshooting I’d recommend putting the fetch part in the FetchXML Builder for the XrrmToolBox. That will allow to query and see the raw data. That’s generally very helpful as it can be difficult to decode these issues when looking at the aggregates.